here’s a short glimpse into what my studies are about. it’s the protocol of a practical class about plant physiology. 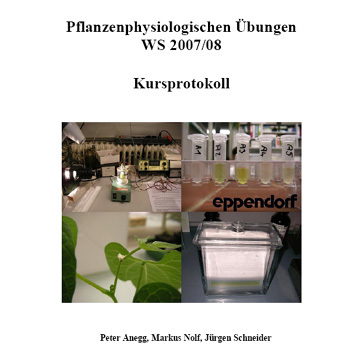 contents: photosynthesis activity and its dependency on temperature (measured by the level of chlorophyll fluorescence), catalases, peroxidases, phenolases, alcohol dehydrogenase, antioxidant levels in foods, chloroplast pigments, measuring photosynthetic oxygen production with isolated chloroplasts, abscission and the role of phytohormones (2,4-dichlorophenoxyacetic acid, α-naphthaleneacetic acid, indole-3-acetic acid). anbei ein kurzer einblick in das biologiestudium: ein praktikums-protokoll aus der pflanzenphysiologie. inhalt: photosynthese-aktivität und der bezug zur temperatur (gemessen über die chlorophyll-fluoreszenz), katalasen, peroxidasen, phenolasen, alkoholdehydrogenase, antioxidantien in lebensmitteln, pigmente der chloroplasten, messung der photosynthetischen sauerstoffproduktion an isolierten chloroplasten, abszission (laubabwurf) und die rolle der phytohormone (2,4-dichlorphenoxyessigsäure, α-naphthylessigsäure, indol-3-essigsäure).